Welcome to DSA Security Services LLC. Mon-Sat 9 A.M. - 6:30 P.M., Sun 11 A.M. - 5 P.M.
DSA Security Services will provide you with the flexibility you need to meet all of your security goals. Our security personnel are comprised of highly trained security officers, ex-law enforcement officers and personnel with vast security experience. DSA Security Services will deliver the best product for your needs. 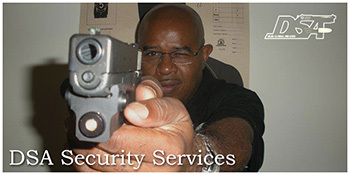 DSA Security Services are designed to address your specific needs, regardless of the size of your company. Security needs change over time and it is important to work with a security company that has the ability to adapt to new challenges facing your organization. We will design a security program that fits the needs of your business. We are a professional, highly trained security company that is totally committed to ensuring the safety of your assets, clients and staff. DSA’s professional well-trained security officers are available for post assignments at public or private establishments/locations, which may or may not include client and/or public interaction. Our professional officers will assist you and your company in identifying and managing incidents and complaints when they arise. Patrol services are available to fit your needs either on foot or mobile patrol. Alarm response is also available. DSA is also available to manage your existing security operations and help with efficiency of operations. DSA’s protection services are available 24/7, with a minimum of time required for emergencies. As a professional security firm, DSA is available to provide consulting services about your facility or current loss prevention programs. DSA is available for special event services no matter the size. Copyright 2014, DSA Security Services L.L.C. The DSA Website was designed, developed and is being maintained by Digital Overlay.